Before I graduated to pork products, bread and butter was my first true love. A simple, complimentary, truly harmonious pair - if only every relationship could be like bread and butter! I’m old-fashioned and I've never been promiscuous about my bread - or my butter. As a child, I was spoiled by quality carbohydrates, thanks to my grandmother who baked most of our bread. Then, when I was older, I worked at a wholesale Italian bakery and habitually helped myself to fresh, hot, free bread. More recently, the gastro-mechanic, Lou Palma, taught me how to make no knead bread, which has quickly become my carb of choice. My children - along with my love handles - swell with excitement when they smell a loaf in oven. With any luck, they'll grow up to be bread snobs, too! 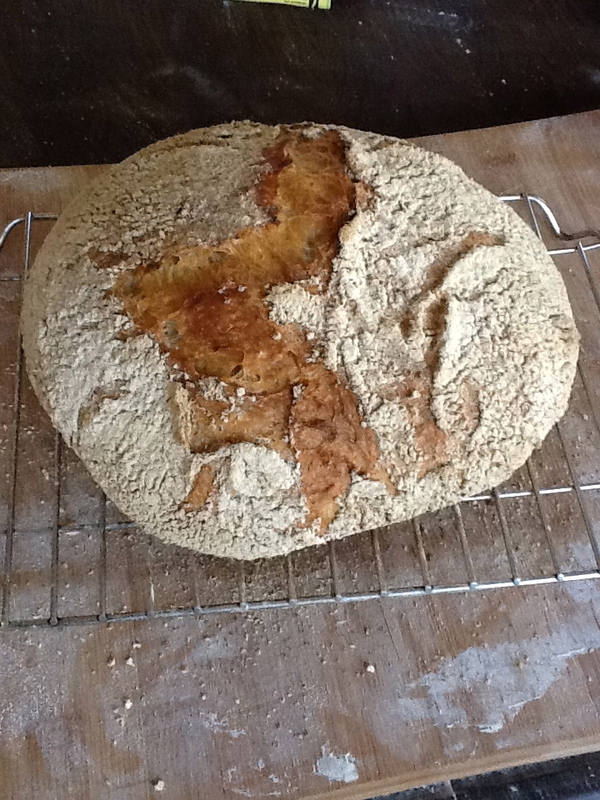 Here’s the recipe I’ve been using for easy no knead bread. The crust is just fantastic, and the inside should show nice air pockets, with a slightly tangy flavor. Mix it up now and it will be ready to enjoy tomorrow. But be patient while it’s fermenting, it’s time well spent. IGood bread deserves good butter, and good butter is real butter. Real butter is a dairy product. And, of course, I like to make my own butter, too, but, that’s not to say there aren’t delicious store bought butters available. Plugra, Kerrygold, and my grandmother’s old standby, Breakstone’s, are just fine with me. If you’re feeling extra-ambitious, and want to make your own butter as well, it's as easy as purchasing heavy cream. I recommend Organic Valley, pasteurized, not homogenized, available at Whole Foods. Pour the cream into a ball jar, and add a tablespoon or two of live culture, like Fage Greek Yogurt, to it. Leave the cream and yogurt mixture on the counter overnight and whip it up the next day. THROWBACK VIDEO: Watch the video to see Allin Tallmadge (remember Tallmadge Cheese Market?) show me how it’s done. It’s worth it! Your love handles will thank you!